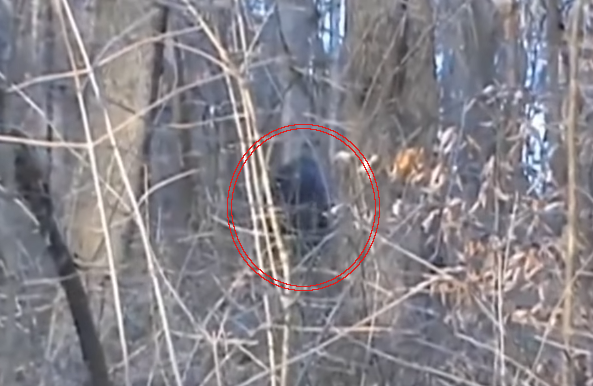 A video was recently upload to Youtube of what is said to be a bigfoot walking in the woods in Ohio. 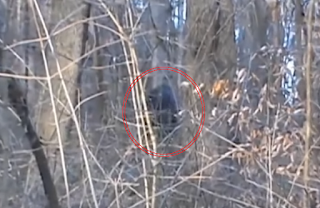 The description is very brief and basically just states that the man was walking in the woods and thought he was alone, when this figure stands up and walks away. In the video below there is an long introduction by the witness and then a couple still shots. During the introduction he tell more about what he saw and the creature. After that the actual clip is played. Now, the biggest problem that most people are having with this clip is that it comes from Jeff Patterson. 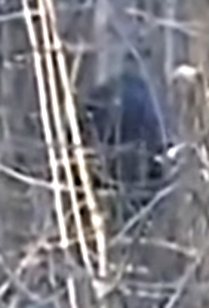 It seems some people think of him as a hoaxer and do not trust his footage. I personally don't have an opinion either way and just want to share the footage. People can make up their own minds as to if it is real or not. It should also be noted that this footage was uploaded on Nov. 6, 2017. I take it this is a very current event. I also want to attempt to enhance the one still frame I used at the top of this post. I know I probably can't get much detail from it, but maybe we can see it a little better. This is just a simple zoom on the figure and some sharpening. Outline of figure. It appears to have a very long arm but it could just be the angle . 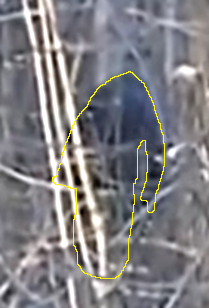 Just a very tight zoom in of the figure. Still not a lot of detail. 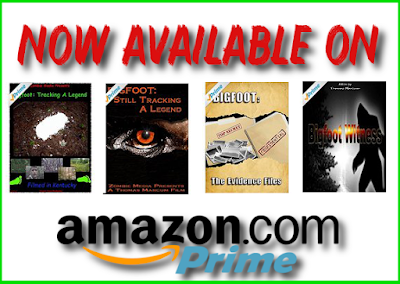 So, just to be clear I in no way endorse this footage as a real bigfoot or as a hoax. I simply find the footage worth a look and wanted to share it. I have not done any hard study of the footage or of the person presenting it. What does everyone else think about it. Thomas, very nice rundown! I accept rocking and swaying to and fro (That's a naturally-rooted primate habit. I find myself doing from time to time), but I kinda draw the line at ambling about and pacing back and forth, because it's to much of a display or demonstration... ...unless it's purposely designed to attract potential or particular prey. Much in the way pack hunters do by distracting their quarry.